Come and join us for 10 days of exhilarating mountain biking adventure in the paradise of Madagascar. Your guide, Adriaan Hefer, has traveled the globe seeking out the greatest adventure experiences, and this is rated as one of the very best. Madagascar is a fascinating country to visit. It very un-commercialised and one is able to feel like you are really exploring a relatively untouched part of our planet. The pristine forests and endemic wildlife, along with endless white sandy beaches make a trip to this special island nation an adventure that you won’t forget. This is a real bucket list tick! The diving rivals the best underwater experiences on our planet, with warm water and abundant sea life including turtles. The people are extremely friendly and always ready to greet the visitor with a big smile – making Madagascar one of the safest destinations in Africa. The eclectic mix of local and French cuisine make the food one of the many highlights. Not to mention the local rum! 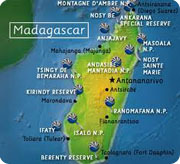 Madagascar is a short three hour flight from Johannesburg. All travel arrangements including flights, transfers and accommodation will be taken care of and along with most of the meals are included in the cost. Mail us for cost. Extra expenses will include drinks, visas, personal extras, bike maintenance and some of the meals. It is advisable to bring your own bikes and essential spares, but we can organise decent bikes to hire over there if need be. This is an adventure mission and the main aim is to have fun, explore the wonderful world of Madagascar, raw adventure at its best, and to do some challenging time in the saddle. There will be 5 days riding, 3“rest” days and 2 days traveling. The route has been done before by Pierre Bester (an old school friend of mine who is based in Madagascar and who owns the Masoala Forest Lodge where we will be staying for 3 nights (and 2 rest days) see www.masoalaforestlodge.com on a motorbike, but none of the party has done the route by mountain bike before – so it is an adventure ride and don’t expect everything to go 100% as planned, that is part of the adventure! We will however be supported by vehicle or boat (where there are no roads) on all cycling routes – and thus food, water, spares, medical aid and emergency evacuation are taken care of. Masoala Forest Lodge is a luxury tented lodge set in a very remote jungle environment that is only accessible by boat. During our three night stay here, all food and various activities are included in the costs. These include snorkelling, kayaking, guided forest walks, guided pirogue trip, traditional Malagasy dancing and music, and a visit to a traditional Malagasy village for lunch. During the guided trips we will have the chance to see natural wildlife including Lemurs. There is the option to do a strenuous and challenging sea kayak trip on one (or both) of the rest days. Our first night will be spent in Antananarivo (or Tana) the capital, where we will get a chance to sample the local cuisine and enjoy a couple of beers. The following two nights will be on the Island of Sainte Marie – where there is a chance to scuba dive. Early the next morning we take a ferry to the mainland before the real adventure begins. Accommodation in Tana and Sainte Marie will be in upmarket hotel or guest lodges. Other accommodation on the cycling route (three of the nights) will be in fairly basic Malagasy bungalows. Please expect the five days of cycling to be fairly tough, and we will encounter all sorts of terrain including thick sandy, muddy and rocky sections. Cyclists will need to have a good level of fitness so that we do not hold back others, as we will be cycling together as a group. We will work together in buddy “teams” of two, who will be expected to cycle together at all times and to share rooms at overnight stops. This trip is limited to 8 cyclists, and it is therefore necessary to confirm your booking as soon as possible and to pay a 50% deposit to secure this. The balance is due 6 weeks before departure. 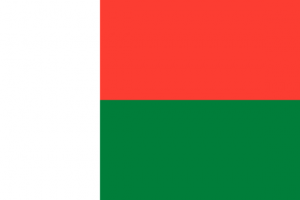 It is not necessary to organise a visa in advance as these are issued on arrival in Madagascar. You will need to organise your own health insurance and Malaria medication. A suggested kit list will be issued on confirmation of your booking. Day 2: Fly to Sainte Marie – setup bikes. Light ride. Scuba diving optional. Evening brief for the mission. Overnight at Baboo Village. Day 3: Full day cycle around the island (50-80km) to Chez Mme Robert. Overnight at Baboo Village. Day 4 :Catch ferry to SoaneiranaIvongo to meet up with land support vehicle. Cycle to Manompana (45km) – Chez Lou Lou (A-frame bungalow on beach) or Mahle Hotel (1km from village on Mahle point. Day 5 : Cycle to Mananara (85 km, sand, rivers, hills, mud, rocks) – stay in Hotel Chez Roger, possible visit to aye-aye island. Day 6 :Cycle 70 km up coast, stay in very basic beach lodge at Rantabe. Day 7 : Cycle to Maroantsetra (45 km), lunch and boat transfer to Masoala Forest Lodge. Day 8 : MFL (rest day), primary forest, beach, snorkel, hike, sea kayak. Day 9: MFL (rest day) – option of long cycle mission through the forest or sea kayak mission. Day 10: Boat to Maroantsetra and Fly Maroantsetra – Tana. Overnight Tana – Farewell party. Day 11: Fly Tana– JHB – Cape Town.